And the award goes to ... the Hoeyes! Each year, the Lou Grubb Friends Fore Golf gives out one special award, the Lou and Evelyn Grubb Spirit Award. This tribute recognizes those who have demonstrated the philanthropic values modeled by Evelyn and Lou Grubb throughout their lives. The award recipient is chosen behind closed doors of the LGFFG Executive Committee, who announce the winner publicly during the annual event. 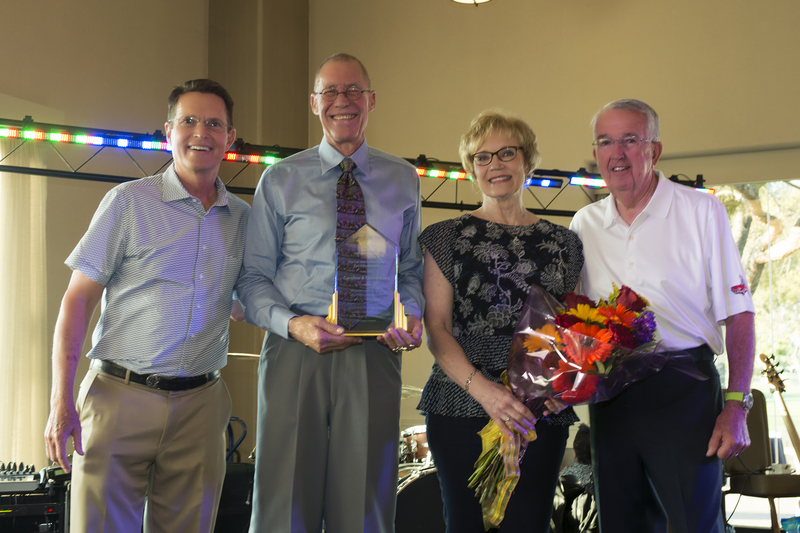 This year, the committee recognized the longstanding commitment of Chris and Caroline Hoeye to the annual golf tournament and their generosity to supporting Dignity Health St. Joseph’s Hospital and Medical Center. For the Hoeyes, giving is a long standing family tradition. The Hoeye family began the nationally recognized “I Can” Foundation in Chandler, a free youth center in the East Valley that offers disadvantaged youths a way to learn goal-setting, decision-making and ways to achieve academic success. There have been and continue to be many additional charities that have been the recipients of this special couple. The Hoeyes became involved with the Lou Grubb Friends Fore Golf tournament 15 years ago. Chris Hoeye, like Lou Grubb, has owned an automotive business for many years. Caroline Hoeye was a banking executive. Each year, they have been the biggest supporters of the tournament outside of the Grubb family. St. Joseph’s Foundation warmly thanks Chris and Caroline Hoeye for their strong commitment to the event and their ongoing support of the hospital! Thank you Lou Grubb Friends Fore Golf for another great event! Read more about the 45th Annual tournament and after-party.